I haven’t eaten mac and cheese in over a month. I know!! Tragic!! But I’m back on the job now and raring to go, so it seemed only fitting that I should apply my new energy and focus to a dish that calls itself “Kicked Up.” It turned out to be a fine choice. The menu is all over the place, too. It adheres to the Cheesecake Factory “something for everyone” philosophy of dining, but on a blessedly smaller scale. Still, there are numerous Asian-ish, Italian-ish, Mexican-ish and healthy-ish offerings in the mix as well as good old American classics. Truxton’s is known for its hearty burgers and garlic fries, and the ones I observed looked and smelled really, really good. I am all in favor of their stated “crate to plate” philosophy of sourcing fresh ingredients locally. The breakfast menu is intriguing enough for a return visit, too. But on this day, my objective was the Kicked Up Mac and Cheese! 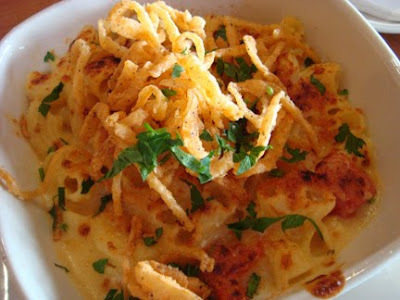 Truxton’s mac is billed as “Jumbo elbow macaroni in our creamy sauce made with a blend of five cheeses and oven roasted tomatoes, topped with crispy onions.” It will set you back only $9.98 for a serving that is ample enough to ensure leftovers. The elbows are a bit larger than usual and they feature prominent ridges in which the sauce may nestle. And what a sauce it is! When the dish arrived at my table, the sauce was too loose, dribbling out of the noodle cavities as I lifted each forkful to my mouth. But after a moment to cool and set up, this runny sauce resolved into a perfect consistency, creamy enough to cling and with just a bit of rebound to it. 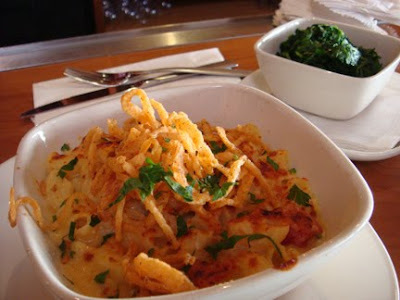 My first bite of Truxton’s macaroni and cheese included a morsel of browned cheesy goodness and suddenly a wave of déjà vu washed over me. It was such a familiar flavor but I couldn’t quite place it. Eventually the server jogged my memory. Turns out the most prominent element of this dish’s five cheese blend is blue cheese. I know!! Unusual. And totally delicious! It really works. She wasn’t 100% positive but my server thought the other four cheeses were Cheddar, Parmesan, Gruyere and smoked Mozzarella. Mmm, does that look yummy, or what?! 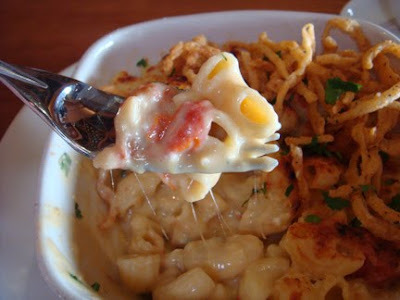 I don’t know if it was because I hadn’t eaten macaroni and cheese in so long, but I thoroughly enjoyed Truxton’s Kicked Up Mac. The sharpness of the blue cheese really won me over. I look forward to dining there again, probably on a Monday evening when wine sold by the bottle is half-price. Care to join me, Hilary?